Ok, this is just a quickie for Roman gaming fans. During my all-too-brief sojourn in Barcelona, I visited the City Museum (more of which another time). 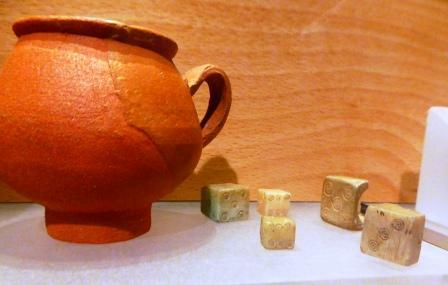 Now, my work on the Roman collection at the LAARC has turned me into something of an obsessive when it comes to seeking out Roman dice and other gaming equipment wherever I happen to be. At the City Museum, the Museu d’Història de Barcelona in the Plaça del Rei, the star attractions are the in-situ archaeological remains of the Roman and post-Roman city. These are amazing and I’ll post some pictures soon, but sitting quite unobtrusively in a display case in one of the small museum areas were these artefacts. 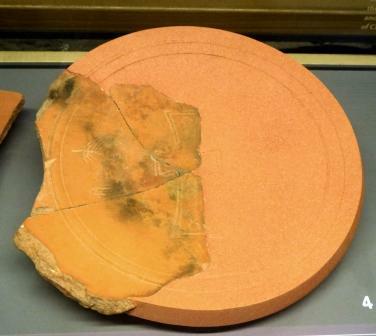 Evidence of gaming and, possibly, gambling in Roman Barca. First, these lovely dice. 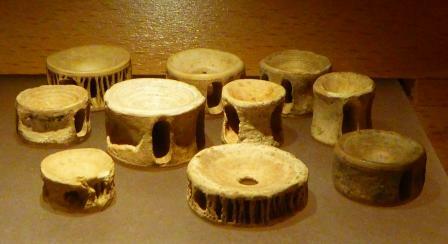 Made from animal bone with either dot-and-ring or dot-and-double-ring pips. NERDS! there’s a fragment of a Type 2 lurking at the back on the right. There could be used in similar ways to dice, but it’s not so obvious how the different sides would be counted, in numerical terms. As the bones’ faces are irregular and uneven, and are assigned different values, weighted to take account of these irregularities. 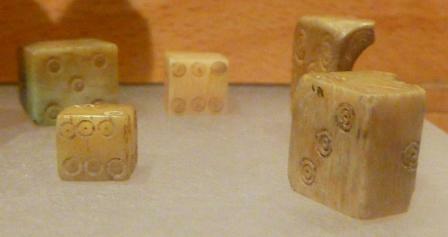 There were also used to play a game called tali (in Latin, or astragaloi in Greek), which is similar to jacks. I haven’t seen any of these in the London collection that have been securely identified as gaming equipment. Plenty as dinner though. They’re gaming counters made from the vertebrae of fish. The spines have been trimmed off leaving just the cleaned up centrum and, although they vary in size, they make great counters. I saw some of these in museums in Tunisia and Algeria and it is particularly interesting to see them here in Barcelona because the museum presents other evidence of contact between Barca and parts of North Africa. 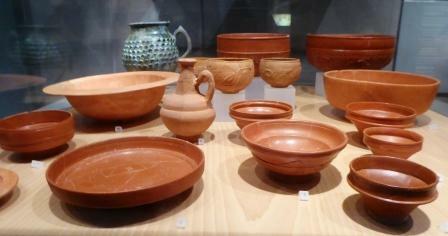 For example, alongside the Gaulish samian ware we see in so many museums, especially in northern Europe, at Barca, the finewares also included African Red Slipware (ARS). Some pieces even have Christian symbolism imprinted or applied to them, highlighting the very active role that Christians in North African cities played in the dissemination and development of early Christianity. A hot-bed of activity which actually moulded the Christian church. 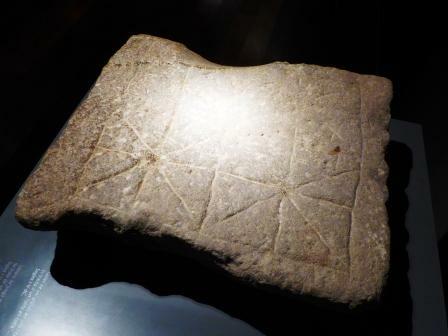 Lastly, a lovely piece to see up close, but terribly lit, is this stone gaming board. The game played on this is called Nine Men’s Morris (or a variant of this game) and is a strategy game in which opposing players try to reduce each others’ counters (‘men’). This is just a tiny glimpse at the delights found in the city museum. And not a Gaudi in sight! This entry was posted in Archaeology, Museums and Exhibitions, Romans, The Big Wide World and tagged Archaeology, LAARC, Museum Blogger, Roman, Roman gaming, Roman North Africa. Bookmark the permalink.